Summer is passing, and for lots of us the weather which is rather changeable has its influence on weaker scores. Despite colder weather the fish behave rather chimerical and they lack summer aggression, which can be felt on the rod. In these situations I am safe because of delicate rod with power supply, precisely made and beautiful to look at. You do not have to be a great fan of tip spin rod to use it. These are the rod for learning how to recognize the bites, contact leading of lure. The rod which I got into my hand is the rod from well known FISHMAKER series with a modest name Sensitive Jig. Precisely the rod with length of 2.45 m and casting weight 1-7g. Together with the rod I used Fishmaker braid with diameter 0.06 mm. despite tiny diameter I was not limited, I was rather surprised by the casting possibilities - the head with 2 g mass plus the mass of the lure could fly like a shot on a given distance. I started my fishing from ubiquitous perch, but it was difficult for me to provoke at least some fish to attack - a tip of a rod was a great help here - it is a kind of signaller which can transmit to our eyes each unnatural behaviour of the lure and bite of course. The tip is probably the most important part of this spinning, together with a proper number of guides ( 10 ) it is characterized by very nice action and bend while fighting. 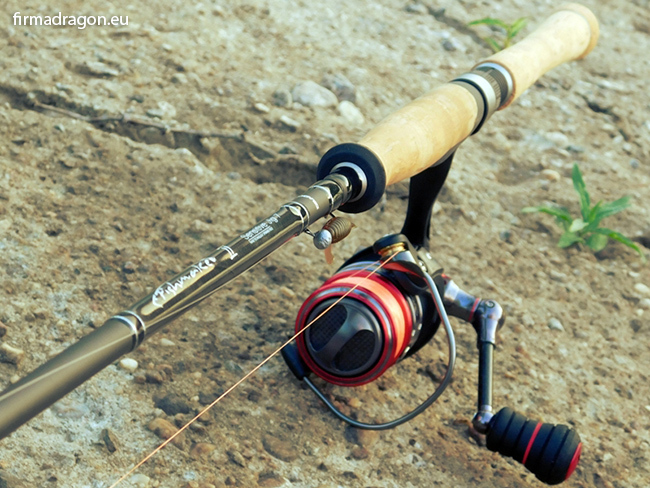 It is very good rod for a person who just starts his/her adventure with this kind of equipment and even for a laymen who starts his/her fishing adventure. The rod was perfect for my up to 7g lures, but for my hand the most comfortable were these with 2 and 3g jig heads.